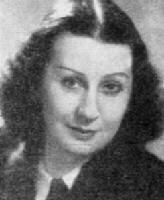 The soprano, Nadia Todorova, was born 6 February 1908 in Kjuistendil. She graduated from the State Academy of Music in 1932 as a student of Ivan Voulpe and Mara Zibulka. During her studies at the Academy the Sofia Opera employed her and after her graduation became one of their leading singers. Between 1943-44 she traveled to Vienna and Salzburg for specialized training. Her debut in 1931 with the Sofia Opera was as Siebel in Faust. Between 1948 and 1954 she made many appearances in Roumania, Czechoslovakia and the USSR performing arias and art songs. Major roles in her career included Tatyana, Natasha in Rusalka and she was well known for her interpretations in the Bulgarian opera repertoire.